Its been interesting to watch the “flu news”. Here in America, it seems some people are finally waking up to the fact that the shot is ineffective at best and dangerous at worst, and exists primarily to make more money for Big Pharma. Haven’t you seen the push to buy the shot? Go into any drugstore and there are signs and ads plastered everywhere urging you to get the jab. At Walgreens the other day I even saw ads pasted on all the glass doors of the milk and water coolers. On Sale because People aren't as Stupid as Last Year! No shortage apparently, exists here in America. In the UK, the story is different. Mike Adams, the Health Ranger sent out a report on the story today and you can almost hear him laughing in the background. It is funny, if it wasn’t so very sad at the same time. So if you’re in the ‘worried well’ group — meaning that you’re healthy but just ‘afraid’ of the flu — then you don’t need a flu shot! It’s astonishing that they finally publicly admit all this, right out in the open. It’s what I’ve been saying all along, of course: A healthy person, armed with vitamin D and other nutrients, can stave off exposure to influenza using the power of their own immune system. They don’t need flu shots! 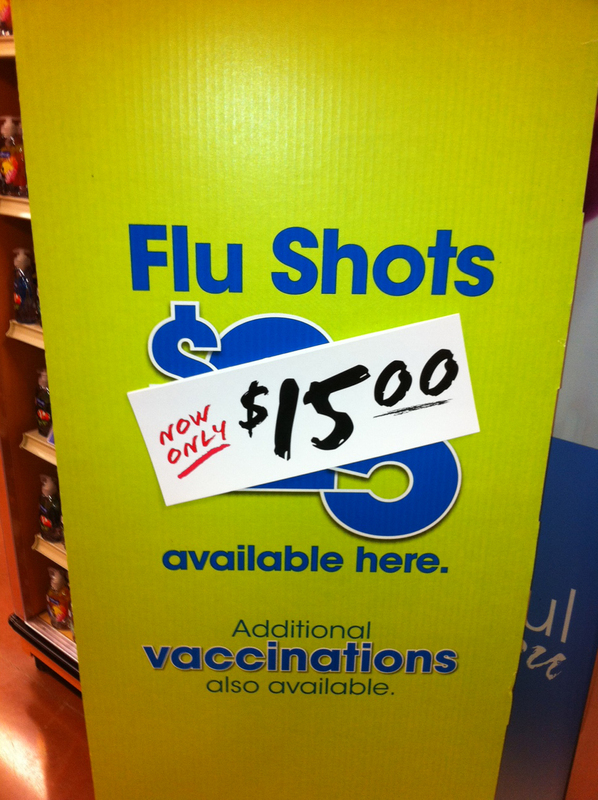 But the flu pimps have been pushing ‘flu shots for everyone!’ regardless of health status. That was being done to sell more flu vaccines, of course. It never had anything to do with actual medical science, because as you can see right now, that quack science falls apart as soon as they run out of vaccines. It’s fascinating that all it took was one vaccine shortage for the truth to come out: Healthy people don’t need vaccines, even according to the vaccine experts! All you need is a healthy immune system folks. Your body is MADE to fight off the flu. Want some extra protection? Try vitamin D3. (Its the sunshine vitamin! Go outside!) Take about 3000-4000 units a day and if you start feeling crummy, increase it to 10,000 to 12,000 per day. The body does not store D3 and it is not toxic, even at levels of 50,000 units or more per day. Why don’t you see ads on TV or in magazines telling you over and over again to buy and take Vitamin D3? Its because its cheap and effective, and doesn’t make Big Pharma the Big Bucks. Stayed tuned though, as the FDA, bed partner to Big Pharma, which is beginning to feel threatened, is positioning itself to control the sale of vitamins and supplements. Its already happening in Europe. We are next. Silly me, I got a flu shot and still got Influenza B… was on Tamiflu, etc… I’ll add D3 to my daily dose. I was silly for years myself! Don’t feel silly any more. Just get D3.